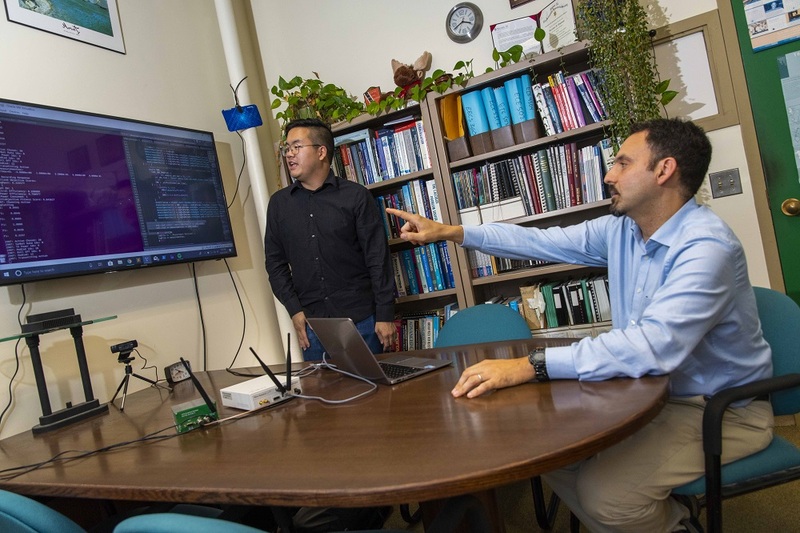 WPI professor Alex Wyglinski (right) and graduate student Max Li are using techniques to improve wireless communications in space. A team of researchers from Worcester Polytechnic Institute (WPI), Penn State, and NASA Glenn Research Center in Cleveland is using the International Space Station as a testbed to evaluate new space communications that could have far-reaching implications for future space missions. The research, in part, uses artificial intelligence to address ways to reduce or eliminate interrupted communications and guard against disruptions caused by space weather and other impairments faced by astronauts and science mission spacecraft. Alexander Wyglinski, professor of electrical and computer engineering at WPI, and his co-investigators recently reported on an in-orbit proof-of-concept experiment using the new algorithm in a paper in IEEE Journal on Selected Areas in Communications. In the paper, the researchers explain that their algorithm was developed using a machine learning technique called reinforcement learning neural network (RLNN). The researchers were able to develop a communications approach that is able to automatically adjust to unpredictable changes in the communications channels while still achieving the mission goals. As a result, multiple communication parameters can be tailored and adjusted in real time to compensate for the harsh space communications environment. Wyglinski received $123,505 from NASA to study the issue. NASA uses the space station, whose orbit is approximately 250 miles above the Earth, to learn about living and working in space and as a testbed for future exploration missions. This particular research used an experimental communication system on board the space station called the Space Communications and Navigation (SCaN) Testbed. Frequently, Wyglinski said, astronauts will encounter a phenomenon known as “space weather,” which refers to charged particles that stream from the sun. When they enter the atmosphere near the Earth’s poles, the particles produce colorful light shows called the auroras, such as the Aurora Borealis or Northern Lights, but they can also disrupt wireless communications in and around Earth. Graduate student Max Li has evaluated the new algorithm. As part of the project, Wyglinski has been working closely with Richard Reinhart, a principal investigator on the project at NASA Glenn, to test the new algorithms using the SCaN Testbed. Reinhart believes the algorithm the research team is developing will provide improved and more durable connections between the Earth and future space missions. “The novel part of the experiment is that the cognitive learning algorithm trains in a way that does not disrupt the communications links,” said Reinhart. Student researchers working on the project were WPI graduate researcher Max Li ’17 and Timothy Hackett, recipient of a Penn State NASA Space Technology Research Fellowship. Both spent several weeks at the NASA Glenn Research Center testing the system. Among other activities, Li ensured that computer code was working properly and evaluated the algorithm. Based on the findings, the research team has a framework on which to build new designs and implementations that can be used across a wide variety of space communications scenarios, including deep space missions. “We expect our results to serve as a starting point for other researchers to refer to and to compare their future work while increasing this technology readiness level,” said Wyglinski. To learn more about Max Li’s experience at NASA Glenn Research Center, read this profile in The Daily Herd. President Laurie Leshin was featured in a WGBH The Curiosity Desk conversation about space science and what to watch for in 2019. She noted the extensive space science research faculty and students are conducting at WPI. In the piece, she also referenced how WPI Researchers may help astronauts keep cool on their way to Mars.